Boeing and Turkish Technic, the maintenance, repair and overhaul (MRO) arm of Turkish Airlines, have signed a Global Fleet Care supplier agreement. “We provide a broad portfolio of MRO services in 50+ International Line Maintenance locations as well as our existing base maintenance facilities in Istanbul and Ankara. In addition to the current services we provide, more will be available to our customers at our brand-new facilities, located Istanbul New Airport as of October 29. We are so glad to announce such a remarkable collaboration with Boeing today, which will significantly contribute and add value to our business in our new home base. 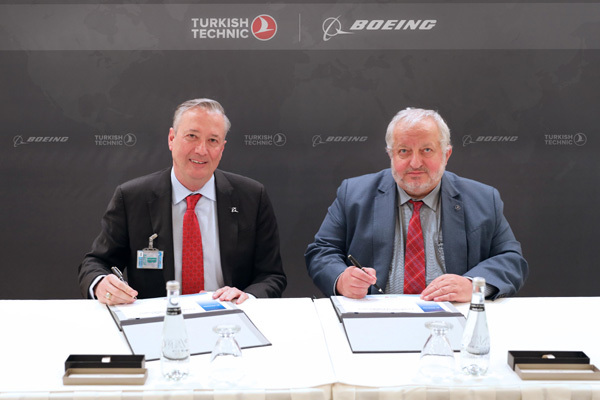 Within the extent of Boeing Global Fleet Care program including aircraft maintenance, repair and training, Boeing operators will be able to experience the world-class quality of Turkish Technic’s MRO services through this agreement,” said Ahmet Karaman, general manager of Turkish Technic. Last year, Boeing and the Turkish Government announced the Boeing Turkey National Aerospace Initiative, launched to support the growth of the Turkish aerospace industry, in conjunction with the targets set by Turkey's Vision 2023 that was specially designed for the 100th establishment anniversary of the Turkish Republic. The initiative outlines a strategic framework that aligns Boeing investment and programmes with the Turkish Government, Turkish airlines, aerospace service companies and industry suppliers in the areas of research, engineering and skills development.